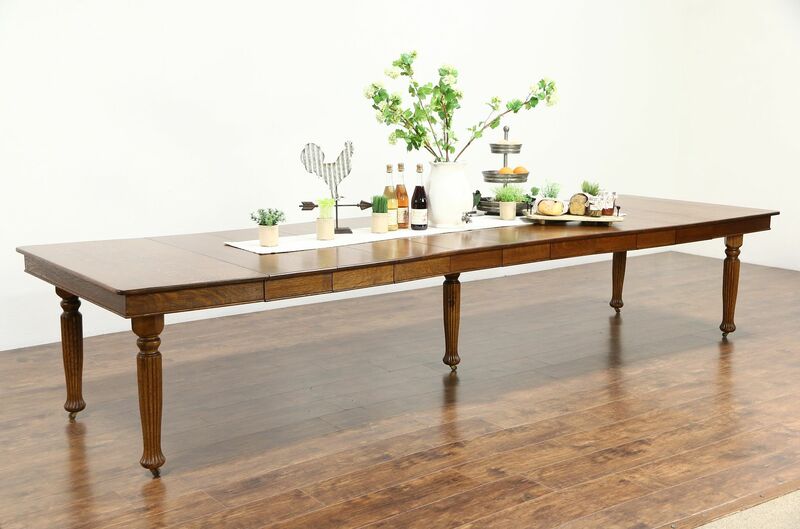 Oak Quarter Sawn Square 1900 Antique Dining Table, 9 Leaves, Extends 12' 8"
A solid quarter sawn oak dining table from 1900 has nine leaves with matching skirts or aprons. The restored finish is in excellent condition, flattering the bold natural grain. Leaves are almost 12" wide and fit and match and fit very well. Five graceful fluted legs include a center leg for extra support when opened on this antique American made furniture. When fully extended, there is a slight waviness in the top from a century of wear on the hardwood slides, see photos. Measurements are 29" tall, legroom is 25," and the top is 45" square when closed, with all nine leaves in place, the table extends to 12' 8" overall.